Download the PDF or scroll to continue. This Annual Report you are viewing on your screen is a first for the parish. I invite you to study the image above: the Cross (symbolizing Jesus’ suffering, which we relived as a community during Holy Week and recall each day of our lives) revealed beyond the Door (open to all, presenting a path toward mercy). So much happens both within and beyond our doors here at ICC, and we want to take a moment to tell you about the progress that we have made in our community over the past year. We have seen several doors open this past year. With the inception of the Bishop Keane Institute, we have opened our doors to the entire Hampton Roads community (Catholic and non-Catholic!) for the sake of intellectual discussion on the Catholic faith from esteemed scholars. Thanks to your contributions to the “Living Our Mission” capital campaign, we opened the door to a newly renovated kitchen to maximize our ability to feed others in our community through our Sunday Supper Ministry. On the staff, we welcomed Vy Barto, our new Administrative Assistant, as well as commemorated Ann Hart’s 25 years on staff. For each of us—visitors, newcomers, longtime and founding parishioners—the doors to this parish mean something different. As you look through this report, consider how our doors invite mercy into the lives of so many, even yourself. We are each truly blessed to form this parish together, and I thank you for your presence to this community. This year, we did not receive the tithes budgeted to support the operating expenses of the parish (see right). We relied on funds from the Foundation that is in partnership with the Somerset Apartments next door to our building. Diocesan Fuel and Hunger Fund: $7,000 to Saturday Bag Lunch, Food Pantry, Sunday Suppers, Morning Financial Ministry and Young At Heart. John C. Fricano Foundation: $5,000 to our Sunday Supper ministry. Diocesan Evangelization Fund: $2,246 adult education and stewardship. Tithing is a conscious and prayerful decision to return a portion of our gifts we have been given from God to support the works that we do in his name. To embrace this selfless act of giving becomes a need embedded in our hearts and is a part of our time and talent stewardship offerings. 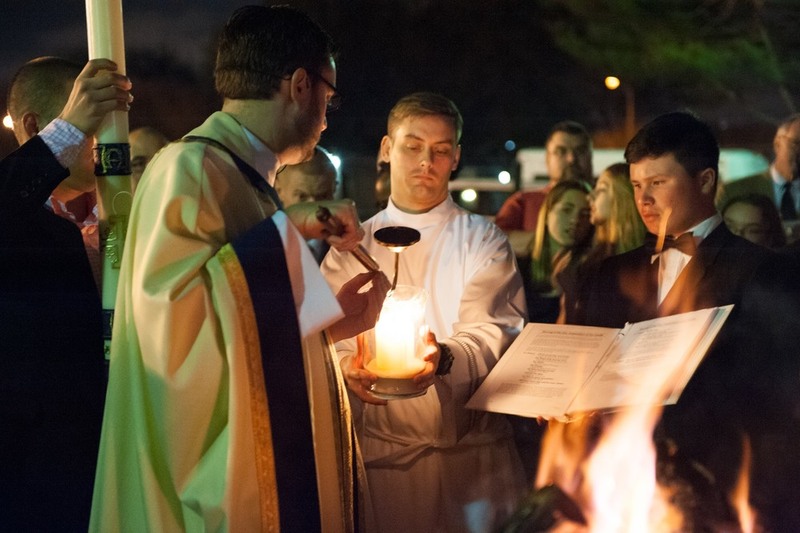 Your tithing funds all expenses relating to the daily operations of the parish as well as supporting the Pastoral Center operations of the Diocese. It also includes the salaries and benefits of all staff members and the financial support of our ministries. Our Food Pantry and Sunday Suppers are funded by separate donations and grant funding. Throughout the year, Fr. Prince's homilies reminded us of God's mercy. All Soul's Day: "To remember is to keep alive, to forget is to let die." Fourth Sunday of Advent: "When life gets turned upside down, Jesus is standing there on the other side saying, 'trust me.'" 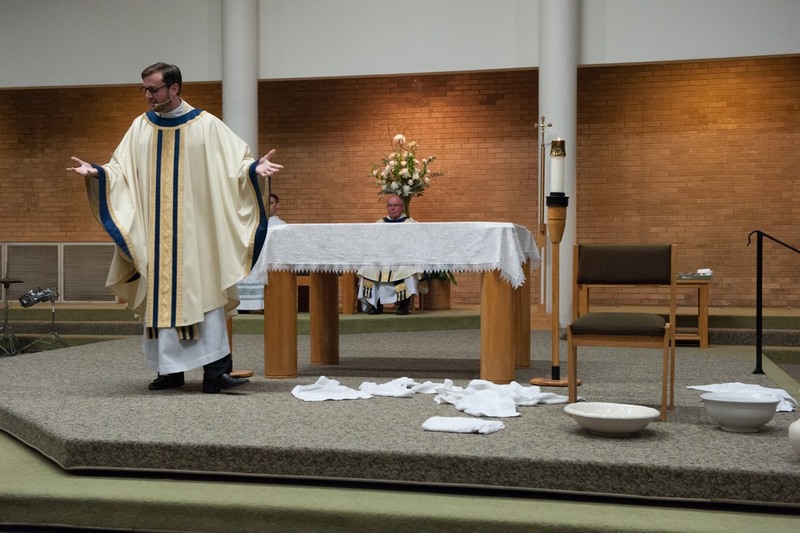 Holy Thursday: "Jesus embraces the mess of our lives." Easter Sunday: "Let Jesus roll back the stones of our closed tombs to allow his transforming mercy and forgiveness to penetrate us." Twelfth Sunday in Ordinary Time: "What makes us distinctive are not the things that separate us, but the things that make us the same, that we share in common: our capacity for love, and compassion, and mercy, and forgiveness, and tenderness, and generosity." Nov 2015: Photos of parishioners' loved ones who have passed surrounding our altar for All Souls. Dec 2015: 150 parishioners made a pilgrimage to the National Basilica in Washington, D.C.
Oct 2015: Our choir led the parish in an evening prayer about Pope Francis' encyclical on the environment, "Laudato Si." 635 individuals participated in this assessment of spiritual commitment and engagement. ICC landed 11% above the national Catholic average of 30% engagement. This survey will be administered every 3 years to track our progress in engagement as a community. Jan 2016: Staff Members, Greg Thompson and Steve DeLaney, sit down to record "Found Human." Jan 2016: Welcome weekend attracted 100+ friends & family. May 2016: Parish Ministry Fair brought all 35 ministries together to encourage new participation from the community. Volunteers this year included both a dedicated team of parishioners as well as local community partners. We provided almost 6,000 meals to those seeking a free meal or conversation with others. Our team made 349 hospital visits while building relationships with those in our community who cannot leave their homes. Parishioners prepared bag lunches and brought them to Langley Village. A new strategic partnership with the Peninsula Foodbank and Save-a-Lot grocery stores gave us discounted and bulk pricing, respectively. 70 Nursing Home Residents Hosted by "Young at Heart"
A monthly luncheon with a community prayer service and bingo game. Utility bills and prescription medicine provided to Hampton Residents. ICC hosted eight guest speakers engaging in dialogue on Catholic thought since its inception in May 2015, regularly filling our Worship Space. Discussion Sessions offered by ICC staff before and after lectures allowed our community to learn about each speaker, and engage in meaningful conversation. Around 30 Middle & High School youth regularly attended weekly programs as well as the Diocesan Youth Conference and Work Camp. New Young Adult programming reached a growing pool of 20s & 30s across the Peninsula. Our "Cave Quest" program brought in students from throughout the area, both parishioners and non-parishioners. 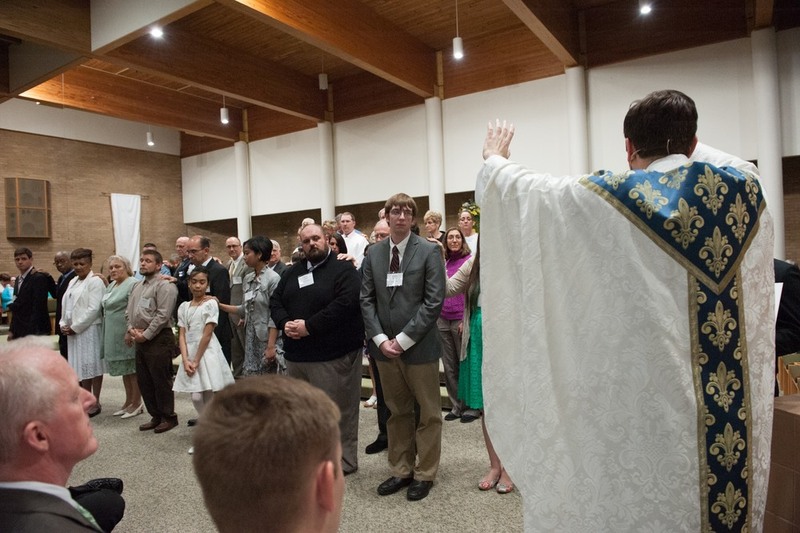 Sep/Oct 2015: 20 parishioners attended Cursillo in Fall 2015. Jan 2016: 80 participated in our Spirituality of Aging retreat for ages 60+. 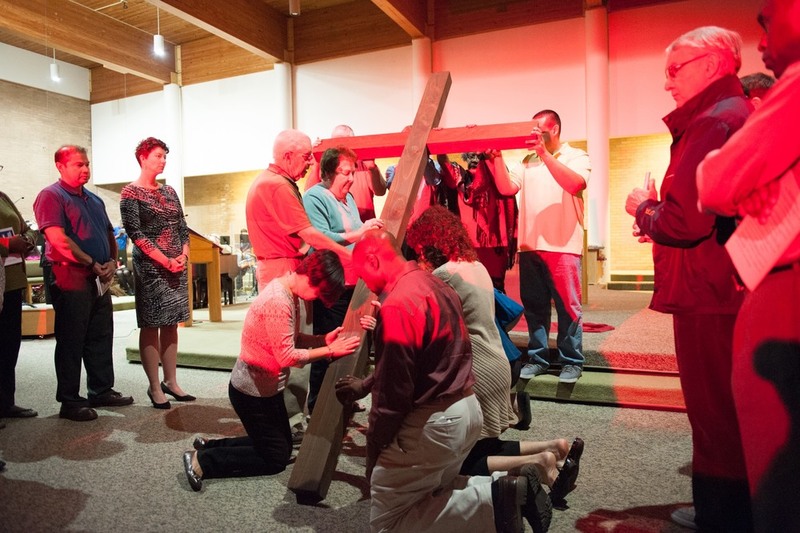 Apr/May 2016: 45 parishioners of all ages took part in "Rediscover Jesus," a small group, based on the book by Matthew Kelly given to every family at our 2015 Christmas Liturgies. May 2016: 35 attended our Crossroads with Christ for ages 40-60. Thank you for supporting our parish community through your contributions of time, financial support and love for one another. In this next year, may you continue to find strength and peace here as you continue on your journey.